Psoriasis is a chronic skin condition caused by an overactive immune system. Symptoms include inflammation, flaking, and thick, white, silvery, or red patches of skin. Anyone can get psoriasis. It occurs mostly in adults, but children can also get it. Men and women seem to have equal risk. Psoriasis can form on the elbows, knees, scalp, lower back, face, palms, and soles of feet. However, it can also affect other places such as fingernails, toenails, and mouth. 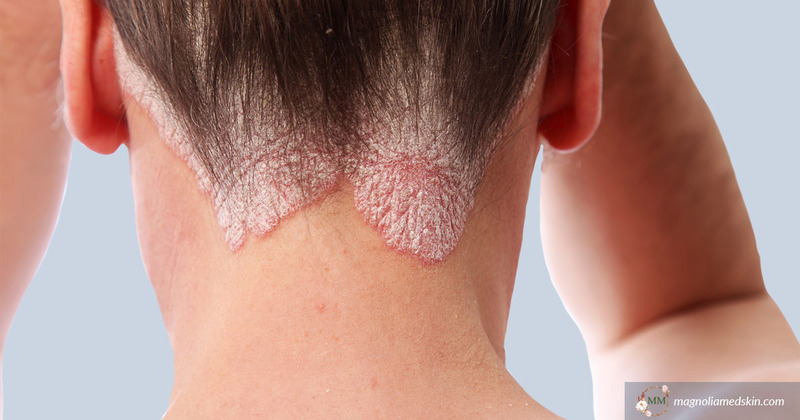 The most common type of psoriasis is called plaque psoriasis. Psoriasis can often be diagnosed just by examining the affected part of your skin. Because psoriasis can sometimes be confused with other skin diseases like eczema, it may be necessary to run some tests. If you see our primary care doctor first rather than a skin specialist, we may refer you on to a dermatologist in San Antonio to have our diagnosis confirmed. A small sample from the affected area is take so that it can be tested in the lab. The sample or biopsy can be performed in the clinic. You will be given a local anesthetic to make the area numb. A small part of your skin will be removed. Lab tests can be performed on this sample to determine exactly what kind of psoriasis you have and to rule out any other kinds of skin disorders. You might need to be tested for other skin conditions such as seborrhea dermatitis, pityriasis rosea, or lichen planus before a diagnosis can be made. If you are diagnosed with psoriasis, we will advise you on the best way to manage your symptoms. Various treatment options are available, including medication that can relieve specific symptoms, phototherapy, and medication that addresses the causes of psoriasis. You will also get support and advice on looking after your skin and living with psoriasis. If you have psoriasis or symptoms of psoriasis, call Magnolia Medical & Aesthetics at (210) 600-3335 or request a consultation online. We can discuss treatment options, how to avoid triggers and flares and how to stay the healthiest you can while managing your condition. You may also enjoy reading: How Much Does Acne Scar Treatment Cost? At Magnolia Medical & Aesthetics in San Antonio, TX, we specialize in the treatment of acne. Acne is the most common skin condition that teens and adults deal with. The goal of our cosmetic dermatological practice is to enhance the quality and health of your skin. Stay current with Magnolia Medical & Aesthetics happenings. Signup to receive our updates delivered directly to your inbox. It’s FREE! Just enter your email address below.